IF YOU THINK YOU ARE TO SMALL TO MAKE A DIFFERENCE YOU HAVE NOT SPENT A NIGHT WITH A MOSQUITO. Just like Kindergarden 58 in Mongolia, Virgen de Fatima in Bolivia, arriving here at Tumaini Children Foundation in Africa has a double meaning. A physical one as we have made it to our destination and a more spiritual one. 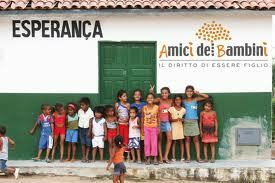 Finally meeting the children for which we decided to devolve our fundraiser, has been a big emotion. It was better than what we anticipated to be. Over 40 children welcomed us, souranding us with amazement and asking questions that weren’t easy to answer right there on the spot. Their curiosity was just as high as ours. Immediately we felt welcomed and we were also literally pushed inside their house. All the children wanted to show us their room and involved us in their activities. Playing ball and dancing to beautiful African music was the main ways to trig their energy. Non Stop energy I mean. During our stay at Tunaini, we witness their joy with dancing, demonstrating that here in Africa, rhythm, is really in the DNA of people. It is very emotional for us to see what Mama Dee and Teacher Oddo have created here at Tumaini. This is a true big family. Every one is taking care of each other, The big kids look after the smaller children in a very sweet way. Of course there are many challenges that need to be looked after: Tumaini is very sensible about taking care of both psychological and health issues of its children. At Tumaini there are currently four children that are HIV positive. Still a major concern here in Tanzania since 5,3% of it population is HIV positive. In this small community every one has its responsibilities. There are some that are dedicated to the vegetable garden, some other to water supply, and other are taking care of cleaning and cooking the Tumaini house. Of course a big percentage of the day is dedicated to school work and playing time which helps the children finding that feeling of serenity, that should be guaranteed in every part of the world. At Tumaini, a big help is being provided by the amazing work of the volunteers. We met here Mama Rebecca, Mama Rosalba with her daughter Erica from Australia, and Holy from Pennsylvania USA. They have been here in Tanzania for a few month now and explained us the many difficulties Tumaini is facing in order to make a difference to the life of these children. Matteo and myself would like to thank all of you that helped us reach our goal in helping less fortunate children in our trip around the world with our motorcycles. Your help has been essential to”our”cause. You have all made a tangible difference…….Trust me ! In order to make an even bigger difference, we have decided to postpone the closing date of our fundraising for the Tumaini Children Foundation, until our return to Africa. In early February, we will start our last leg of our trip around the world that will take us back to Italy where all this “mad” adventure began in late 2011. Our last leg will take us across Kenya, Uganda, Ethiopia, Sudan, and Egypt. For those of you who haven’t had a chance to donate to the “cause” this is the time to do it by clicking below. Remember: “If you think you are too small to make a difference you have not spent a night with a mosquito”.